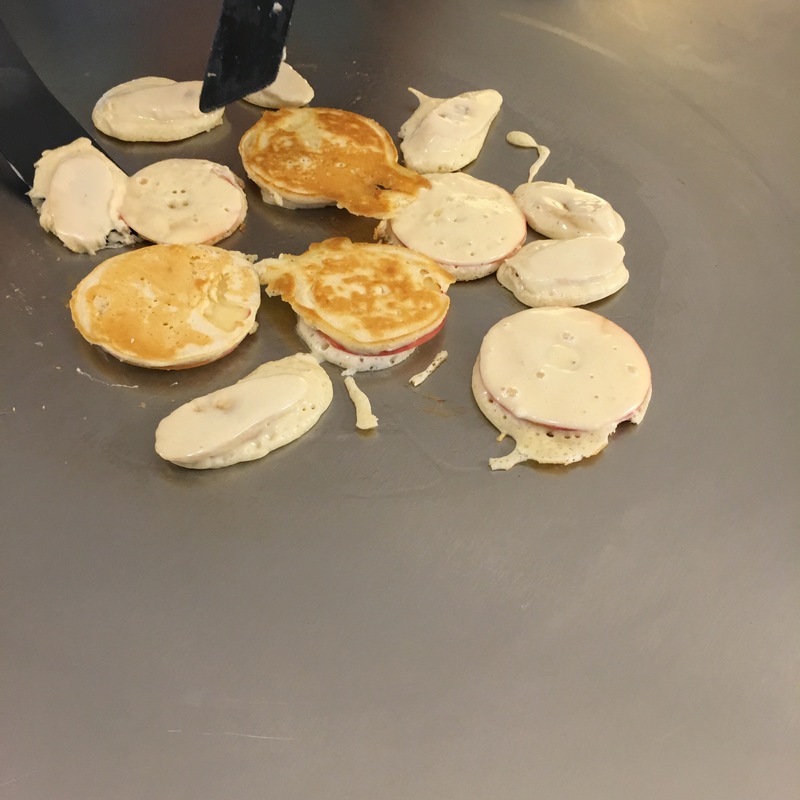 Pancakes and Teppan-apples! – Teppanyaki Beyond Stir Fry. One question we hear A LOT is: Can you make pancakes on the Cook-N-Dine? The very simple answer is: YES! You absolutely can, and should! Pancakes are quick and easy, and since we were feeling quite adventurous we decided to try our hand at making some Teppanapples, too. You may be asking, “What in the world is a Teppanapple?” Well, it is somewhat of a cross between a crepe and a fritter. Oh, and it’s delicious! 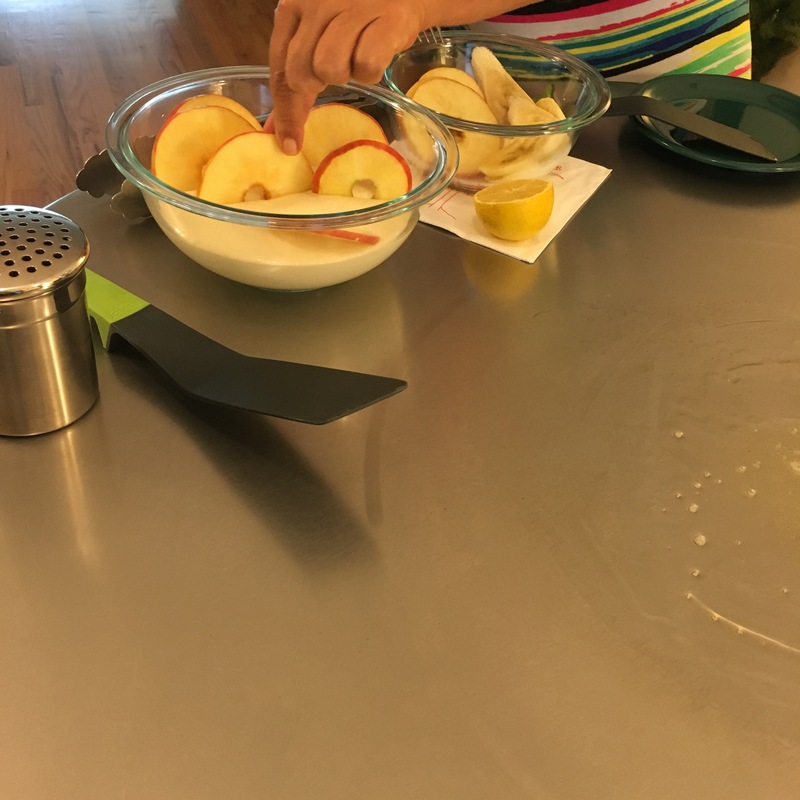 Preparing the batter for pancakes and Teppanapples is the same, so you can enjoy these at the same time or save batter from your morning pancakes for a Teppanapple snack later in the day. To make the batter, mix 1.5 cup of self-rising flour with 1 egg, 1 cup of milk, 2 tablespoons of rum or brandy, a pinch of sea salt and 2 tablespoons of fine sugar. For the Teppanapples, we also made a cinnamon sugar to top them with; mix 8 tablespoons of sugar in the raw and 2 teaspoons of cinnamon. 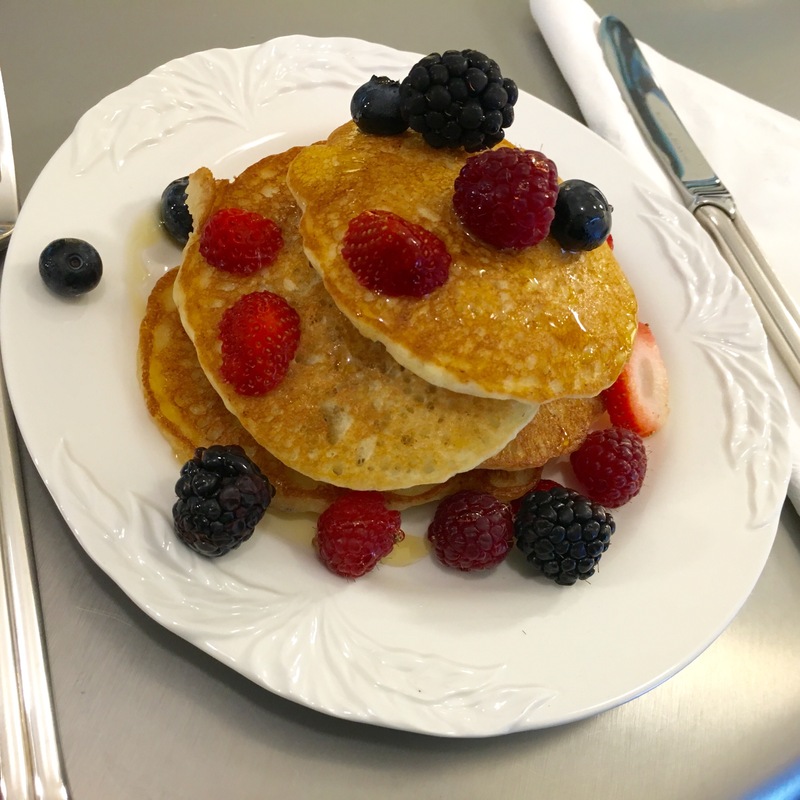 We really enjoy fresh fruit with our pancakes, so we went with some fresh berries. Preheat your Cook-N-Dine at level 5, then turn it up to level 8. Clarified butter is a great prep for your Cook-N-Dine cooktop, or skillet, because it can be used at high temperatures without burning and gives you that yummy buttery taste. Pour small circles of batter on to the melted butter. They will stick at first, releasing once cooked through on the underside. 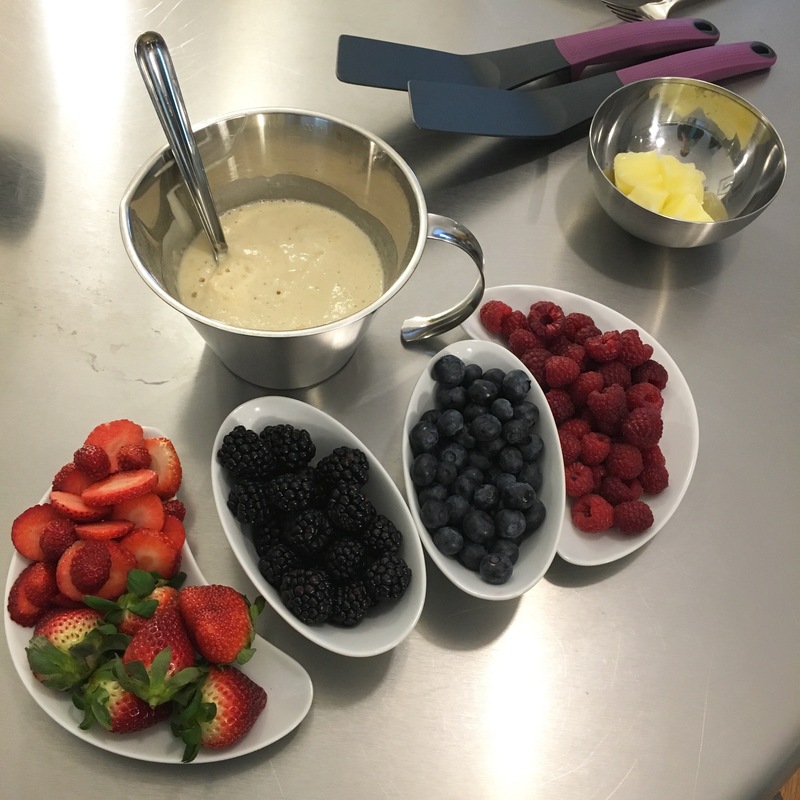 We were feeling adventurous and decided to add in some blueberries and raspberries in to the poured batter before flipping; this made them warm, soft and sweet which added quite a different flavor than just the fresh fruit on top. Once the underside has released and bubbles have appeared on the top, it’s time to flip the pancakes over. If you added fruit to the batter, they can be a little heavy to flip so be careful to not let them break apart. Once flipped the other side only needs to cook for about a minute or two before serving. Top with fresh fruit, powdered sugar, agave or maple syrup, what ever your hungry heart desires! Now that you’ve enjoyed some pancakes on your Cook-N-Dine, it’s time to have some fun with our Teppanapples. Thinly slice (about 1/8 inch) a couple of apples and dip them in to the batter, fully covering them. You can also play around with other fruits in the batter; we decided to slice up a banana as well. Just like with the pancakes, preheat your Cook-N-Dine at a level 5 and then bring it up to temperature level 8. Use tongs to remove the dipped fruit from the batter, and place them on to the cooktop. These will also stick at first, once they release gently flip them over to cook the other side for about one to two minutes. Serve the Teppanapples and top with the cinnamon sugar. If you’re feeling really feisty, maybe serve them with a bowl of vanilla ice cream. Yum!